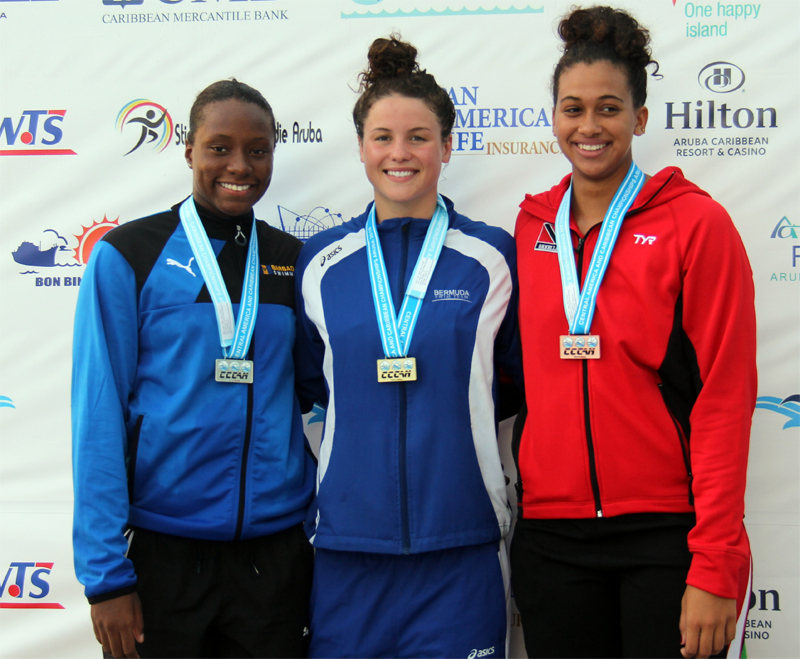 Bermuda swimmers were back in action on the third day of the CCCAN Swimming Championships in Aruba, continuing to impress with their medal winning performances. Bermuda swimmers took their overall medal count to sixteen after winning eight more medals during the day, claiming 4 Gold, 3 Silver and 1 Bronze Medal on the day. During the 13-14 Boy’s 200m Freestyle Final Brian Desmond won the Gold Medal when he touched the wall in a time of 1:59.73, while Adam Young finished 5th in 2:05.74. Bermuda also won the 13-14 Girls 200m Freestyle Gold Medal which was captured by Logan Watson-Brown who was clocked at 2:08.84, with Payton Zelkin finished 8th in 2:19.69. Vanessa Esposito finished 5th competing in the Girls 18 & Over 200m Freestyle stopping the clock in a time of 2:11.36, while Jesse Washington won the Boys 18 & Over 200m Freestyle Bronze Medal when he was clocked at 1:54.22. With a time of 31.07, Jaedyn Judd finished 5th competing in the 11-12 Girls 50m Butterfly Final. Madelyn Moore won the 15-17 Girls 50m Butterfly Gold Medal touching the wall in a time of 28.13, while Vanessa Esposito finished 6th in the Girls 18 & Over 50m Butterfly Final clocking 30.95 and competing in the Boys 18 & Over 50m Butterfly Final saw Jesse Washington finish 6th in 25.75. During the 13-14 Girls 100m Backstroke Taylor White finished 6th in 1:12.51, Pitman was 7th in 1:12.82. Adam Young finished 4th in the 13-14 Boys 100m Backstroke Final in 1:03.01, while Jack Harvey finished 6th in 1:03.85. Shannon Hassell finished 6th competing in the Girls 18 & Over 100m Backstroke Final in 1:08.83. Zelkin won the 13-14 Girls 400m IM Silver Medal when she was clocked in 5:18.99, Taylor White finished 5th in 5:28.43. During the 13-14 Boys 400m IM, Jack Harvey finished 5th in 5:05.53 and Sam Williamson was 6th in 5:05.75. Powell was clocked at 5:25.68 on her way to a 7th place finish in the 15-17 Girls 400m IM. Bermuda’s 13-14 Girls 4×100 Freestyle Relay team captured Gold with a time of 4:07.67, while the 13-14 Boy’s 4×100 Freestyle Relay team captured the Silver Medal in 3:46.61.